A study on radon concentration in groundwater samples collected from different villages of Sira and Tiptur taluk of Tumkur district has been conducted using emanometry method, and the effective dose to the public was estimated. The geometric mean of the activity concentration of dissolved radon was found to be 39.13 ± 1.99 and 3.78 ± 0.05 Bq/L for Sira and Tiptur taluk, respectively. The total annual effective dose for adult, children, and infants was also estimated and was found to be 0.20, 0.18, and 0.31 mSv/year, respectively, in Sira taluk and 0.019, 0.017, and 0.029 mSv/year in Tiptur taluk, respectively. Water samples were also analyzed for the physicochemical parameters to assess the quality of drinking water and also to understand the influence of these parameters on dissolved radon concentration. Poor correlation was observed between dissolved radon concentration and pH in both taluks. Radon is a naturally occurring, odorless, tasteless, inert gas that cannot be detected by human senses but can be identified by different measurement techniques. Radium is known to be embedded in the rocks; hence, it spends much time in contact with the water present in the fractures of the rock system and dissolves easily in the water which occupies the fractures. Radon which decays from radium can also enter into the voids filled with water in the soil grain. As a result, groundwater gets contaminated by dissolved radon. It has a higher solubility in water, with the mole fraction of 1.25 × 10−5 at 37°C, which is 15 times higher that of the neon and helium and readily dissolves in water, especially if the water is somewhat acidic and not rich in minerals and in alcohol and fatty acids. Radon in water can enter into the human body by ingestion and inhalation. When radon and its progeny are inhaled or ingested, the emitted radiation affects the internal tissues of the human body. It has been estimated that more than 50% of the natural radiation dose is due to the ingestion and inhalation of radon and its progeny. In prospect of this, the activity concentration of dissolved 222 Rn was measured in the groundwater samples collected from Sira and Tiptur taluk of Tumkur district, which is the major source for the drinking purpose. Attempts were also made to understand the dependence of dissolved radon concentration on pH and the total dissolved solids (TDS). Groundwater samples were collected from different villages of Sira and Tiptur taluk of Tumkur district [Figure 1]. Sira taluk is located at 13.75°N 76.91°E and spreads over 17.47 km 2. According to the 2001 census, it holds a population of 50,056. Approximately 13% of the population are below 6 years of age. Tiptur is located at 13.26°N 76.48°E. It is located approximately 73 km west of Tumkur and about 141 km northwest of Bengaluru city. It spreads over 11.6 km 2 and according to the 2011 census, it holds a population of 59,490. Approximately 11% of the population are below 6 years of age. The district is underlain by Metasediments (Limestone) and Metavolcanic (quartzite and schists), Peninsular gneisses, and closepet granite of preCambrian age. A narrow range of granitic hills grouped under closepet granites occupies the eastern part of Tumkur district, which comprising schistose rocks passes through the Sira taluk. Three types of soils are found in the district – red loamy occurs in eastern central region of the district, red sandy soil covers most of the area, and mixed red and black soil covers a minor portion of the territory in the northwestern part of Chikkanayakanahalli. Where CRn is the dissolved radon concentration (Bq/L), D is the background subtracted counts, V is the volume of water (mL), E is the efficiency of the scintillation cell (74%), λ is the decay constant of radon (2.09 × 10−6/s), T is the counting delay after sampling (s), t is the counting duration (1000 s), and θ is the delay between water sampling and de emanation of radon from water sample to scintillation cell(s). Where CRnw is the radon concentration in water (Bq/L or kBq/m 3), Raw is the radon in air to the radon in water concentration ratio (10−4), F is an equilibrium factor between radon and its progeny (0.4), I is the average indoor occupancy time per individual (7000 h/year), and DCF is the dose conversion factor for radon exposure (9 nSv/[Bqh/m 3]). Where CRnw is the radon concentration in water (Bq/L or kBq/m 3), Cw is the weighted estimate of water consumption, and EDC is an effective dose coefficient for ingestion (3.5, 5.94, and 23 nSv/Bq for adults, children, and infants respectively). The activity concentration of dissolved radon in the collected groundwater samples ranged from 11.34 ± 0.33 to 202.14 ± 23.87 Bq/L in Sira taluk and it ranged from 1.59 ± 0.02 to 10.18 ± 0.23 Bq/L in Tiptur taluk and is shown in [Figure 2] with a geometric mean of 39.13 ± 2.34 and 3.78 ± 1.81 Bq/L, respectively. According to the United States Environmental Protection Agency (USEPA) and the Maximum Exposure Guideline for Radon in drinking water, the maximum contaminant level (MCL) is set to range from 11 to 148 Bq/L (300–4000 pCi/L). From the present work, it can be seen that the activity concentration of dissolved radon in Sira and Tiptur taluk is well within the suggested range (except that of sample S1). Since groundwater is the major source for drinking purposes, ingestion of radon through drinking water pathway is also considered. Also radon being a gas move to indoor air from water when water is used in the dwellings by the residents for various purposes. When the air containing radon is inhaled, the radon daughters bind to the tissue of the lung and deliver a radiation dose to the surrounding tissues. Hence, it is necessary to monitor the dose received by the residents through ingestion and inhalation of indoor air contaminated by radon and its progeny. In view of this, the total annual effective dose to the public was estimated and is tabulated in [Table 1]. The annual inhalation dose is found to vary from 0.03 to 0.51 mSv/year in Sira taluk and it varies from 0.004 to 0.026 mSv/year in Tiptur taluk, with the geometric mean of 0.10 and 0.01 mSv/year, respectively. The annual ingestion rate was calculated for the three age groups by considering the respective intake of water (adult - 730 L/year, children - 330 L/year, and infants - 230 L/year). 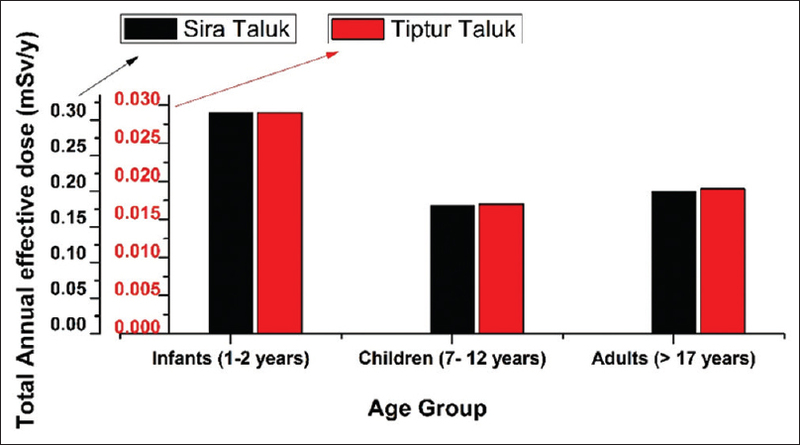 The geometric mean of annual ingestion dose for adults, children, and infants is found to be 0.10, 0.08, and 0.21 mSv/year, respectively, in Sira taluk and 0.01, 0.007, and 0.02 mSv/year, respectively, in Tiptur taluk. 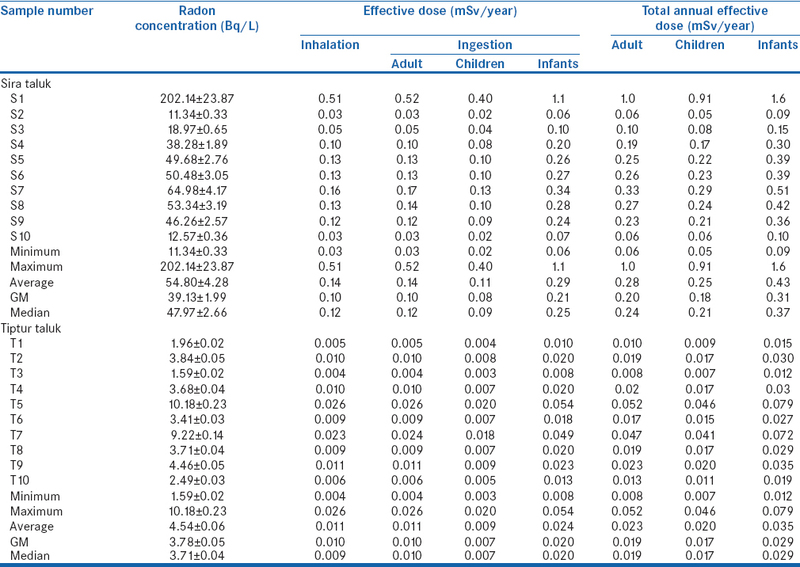 The geometric mean of the total annual effective dose for adults, children, and infants is found to be 0.20, 0.18 and 0.31 mSv/year, respectively, in Sira taluk and 0.019, 0.017, and 0.029 mSv/year, respectively, in Tiptur taluk and are as shown in [Figure 3] and [Figure 4]. The total annual effective dose received by the public is observed to be well within the suggested value 10 mSv/y by the ICRP 2007 and Radiological safety in health care: Guidelines, Practice and outcome (BARC guideline). The values of dissolved radon concentration obtained in the present study are compared with those reported for other environments and are as shown in [Table 2]. From the table, it can be seen that the observed range in groundwater samples of Sira taluk is comparable to the values reported by Shivaprasad et al. and Srilatha et al. for the environments of Bengaluru, Tumkur, and Ramanagara, respectively., Whereas, they are high when compared to those reported for the environments, namely, Iran, Malaysia, Mandya, Rajasthan, Thailand, China, and Pakistan.,,,,,, On the other hand, groundwater samples of Tiptur taluk exhibit comparatively very low concentration. The respective water samples were analyzed for physicochemical parameters, namely, the pH and TDS using ECIL digital pH meter and Eutech CON 700, respectively, to understand the dependence of dissolved radon concentration on these. The results are tabulated in [Table 3]. The measured pH values (geometric mean) in both the taluks are well within the safe limit as recommended by the Bureau of Indian standards and WHO (6.5–8.5) whereas the level of TDS is higher than the recommended value of 500 ppm , in Sira taluk (except at S9 and S10). The correlation study shows poor correlation with pH (R = −0.26) and TDS (R = −0.21) in Sira taluk. This may be ascribable to the inert nature of radon whereas in Tiptur taluk a moderate correlation with TDS (R = 0. 54) and poor correlation with pH (R = −0.19) was observed. Kumar et al. have ascribed that high salinity, TDS, and high ionic conductivity increases the solubility of uranium, which may be the reason for observing a moderate correlation with TDS in the Tiptur taluk. The activity concentration of dissolved radon observed in the present investigation is well within the MCL as proposed by USEPA. However, the samples from Sira taluk exhibit relatively higher values than those of Tiptur taluk. 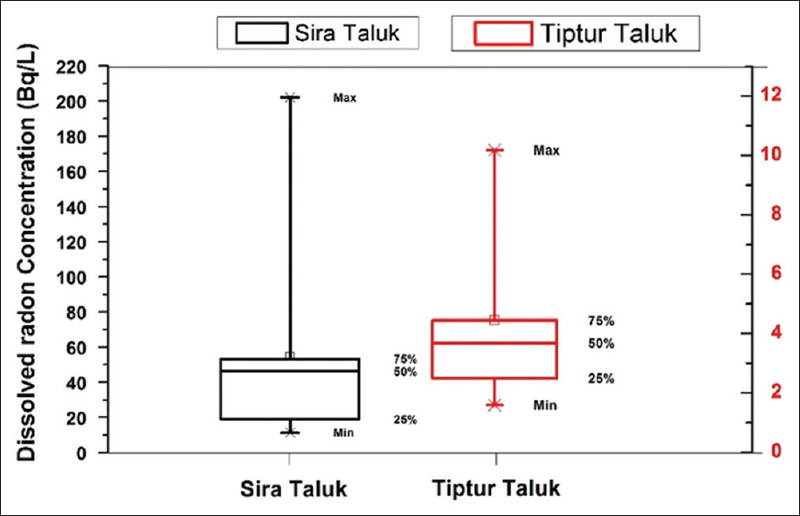 From the Box-Whisker plot [Figure 2], it is seen that the distribution of dissolved radon concentration in groundwater of Sira taluk shows large variation whereas in Tiptur taluk, it shows uniform distribution. The wide variation in the activity concentration of dissolved radon observed in Sira taluk may be due to the kind of underlying rock system in the study location which mainly comprises gneisses and granites. The authors are very much thankful to the University Grants Commission for providing the funds under the MRP scheme to carry out this research work. This study was supported by the University Grants Commission - MRP. Pourhabib Z, Binesh A, Arabshahi A. Evaluation of the radiation dose from radon ingestion and inhalation in water supplies of Sadatshahr and Javaherdeh in Iran. Environ Res J 2011;5:170-2. Tayyeb ZA, Kinsara AR, Farid SM. A study on the radon concentrations in water in Jeddah (Saudi Arabia) and the associated health effects. J Environ Radioact 1998;38:97-104. 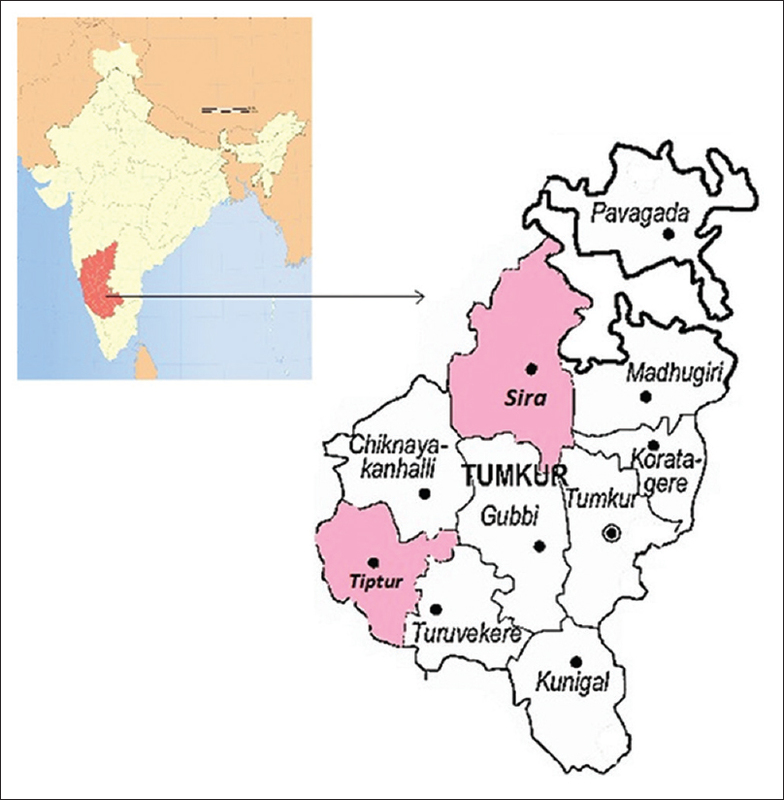 Groundwater Information Booklet of Tumkur District, Karnataka, Government of India Ministry of Water Resources, Central Groundwater Board, South Western region Bangalore; 2008. Raghavayya M, Iyengar MAR, Markose PM. Estimation of radium-226 by emanometry. Bull Radiat Prot 1980;3:11-4. United Nations Scientific Committee on the Effects of Atomic Radiation, Exposure from Natural Radiation Sources, Annex B. New York: United Nations; 2000. United State Environmental Protection Agency, National primary drinking water regulations for radionuclides. Washington DC: US; 1991. Maximum Exposure Guidelines for Radon in Drinking Water; October 2006, Environmental & Occupational Health Program – Maine Center for Disease Control & Prevention, Augusta, ME 04333. Ahmed N, Jaafar MS, Alsaffar MS. Study of radon concentration and toxic elements in drinking and irrigated water and its implications in Sungai Petani, Kedah, Malaysia. J Radiat Res Appl Sci 2015;8:294-9. Shivaprasad NG, Nagaiah N, Ashok GV, Mahesh HM. Radiation dose from dissolved radon in potable water of Bangalore environment, South India. Int J Environ Stud 2007;64:83-92. Srilatha MC, Rangaswamy DR, Sannappa J. Studies on concentration of radon and physico-chemical parameters in groundwater around Ramanagara and Tumkur districts, Karnataka India. Int J Adv Sci Tech Res 2014;4:641-60. Shivakumara BC, Chandrashekara MS, Kavitha E, Paramesh L. Studies on 226 Ra and 222 Rn concentration in drinking water of Mandya region, Karnataka state, India. J Radiat Res Appl Sci 2014;7:491-8. Duggal V, Mehra R, Rani A. Analysis of radon concentration in drinking water in Hanumangarh district of Rajasthan, India. Radiat Prot Environ 2013;36:65-70. Charoensri A, Siriboonprapob S, Sastri N. Analysis of radon in shallow-well: A case study at Phichit subdistrict in Songkhla province, Thailand. J Phys Conf Ser 2015;611:1-6. Wu YY, Ma YZ, Cui HX, Liu JX, Sun YR, Shang B, et al. Radon concentration in drinking water in Beijing city, and contribution to radiation dose. Int J Environ Res Public Health 2014;11:11121-31. Manzoor F, Alaamer AS, Tahir SN. Exposures to 222 Rn from consumption of underground municipal water supplies in Pakistan. Radiat Prot Dosimetry 2008;130:392-6. World Health Organization. Guidelines for Drinking Water Quality. 4th ed. Geneva: World Health Organization; 2011. Kumar A, Rout S, Narayanan U, Mishra MK, Tripathi RM, Singh J, et al. Geochemical modeling of uranium speciation in the subsurface aquatic environment of Punjab state in India. J Geol Min Res 2011;3:137-46.
International Commission on Radiological Protection. The 2007 Recommendations of the International Commission on Radiological Protection. Annals of the ICRP 2007. Oxford: ICRP Publication 103, Pergamon Press. 2007.